What is a Written Statement for Park Homes? A Written Statement for park homes is a legal document which covers a variety of important aspects of owning your park home. The Mobile Homes Act 1983 outlines what is required by owners of park homes, as well as the rights of the park home owners. What does the Park Home Written Statement contain? Consolidated implied Terms cover terms regarding termination of the contract by either party, sale of the mobile home, and fee reviews, to name a few. These Implied Terms cannot be changed and are automatically included. Express Terms – these Express Terms will be added into the agreement by the park owner. They should be agreed by both parties before signing. They tend to cover the conduction of park home sales, moving, and termination of the contract. 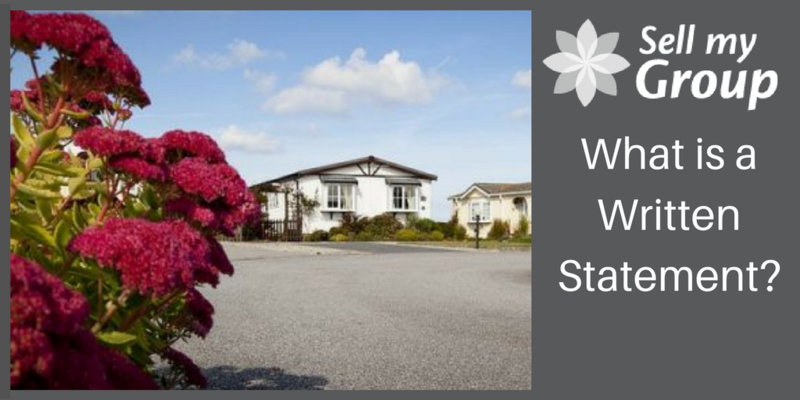 When you purchase a holiday home from the park owner, you will then go onto discuss the terms of the contract. Thus putting them within The Written Statement. The same process will apply if you are planning on moving your existing park home onto a new park resort. The Mobile Homes Act 1983 protects both parties with certain implied terms which cannot be changed. The park site owner will normally provide you with a Written Statement. The Written Statement sets out the terms and conditions of you residing on the park. This is given 28 days before you are required to sign. A park owner cannot be enforce any express terms if a written statement is not received. A Written Statement is set out to protect both parties. You can apply to a tribunal in order to request a Written Statement if the park owner refuses to issue one. If either the mobile home owner of the park owner wish to change any details within the Written Statement, mid-contract, then they can apply to a tribunal in order to do so. You need not make contact with the site owner when buying a second hand park home from an existing owner. The Mobile Homes Act stated this in changes after 2013. This applies only to England currently, and not Wales. You will, however, be subject to the terms implied by the previous Written Agreement. It is possible for a family member to give or receive a park home, under the existing Written Agreement with the site owner. This is again due to The Mobile Homes Act 1983. The site owner is not required to approve such an exchange, and the existing Written Agreement will apply. However this is currently just in England, and not Wales – where consent from the site owner is required. It is important that legal advice is sought when buying, selling, or transferring a park home. This is also the case when entering into a contract between a park home owner and park owner. Before signing anything it always makes sense to have the contracts professionally looked over. The Written Statement essentially is an agreement between the park home owner, and the site owner. Factors differ in differing circumstance depending on the terms and conditions set out. The changes that are taking place. Therefore, it is always best to check over and refer to your agreement when planning to sell or transfer your mobile home. Other paperwork may also be required to be completed between the buyer and the seller. The UK Government have a park homes advice line, run by the Leasehold Advisory Service (LEASE) – 020 7383 9800. Take a look at our other blogs which offer advice on buying like whether you need to pay stamp duty when purchasing a park home.